Only lately have record companies shown any reluctance to sign outstanding violin talent. Nor have concert bookings become a problem for the stalwart gang of youngsters who play the violin well. I am not a steady concert-goer, but I have managed to hear in concert most of today's hot young violinists. Cellists, on the other hand, are as hidden as our old ICBMs. Record companies, even in their heyday, would only sign a single cellist to a contract, making it difficult for any others to find, as we used to say, a public. Right now, at Sony there's Yo-Yo Ma, at Deutsche Grammophon you'll find Mischa Maisky, and at Philips Julian Lloyd Webber. RCA used to think Ofra Harnoy's cleavage an unbeatable attraction, but lately have been stuck with the brainy Steven Isserlis. And whenever they want to, the old guys, Janos Starker and Mstislav Rostropovich, can find a stage for themselves. That leaves a remarkable number of remarkable cellists whom we never get to hear. Nathaniel Rosen and James Kreger are two national treasures who record now and then, and whose discs are always worth finding. Seven years ago I reviewed these performances of all of Mendelssohn's published music for cello and piano (Mar/Apr 1992). I liked them, especially the first sonata. Every now and then in the intervening years I have listened to the original disc and derived much pleasure from it. Re-reading what I wrote then, I must have been brash enough to think years ago that better performances might appear. My remarks seem a bit picky as though I were judging figure skaters and I felt compelled to leave room on my judgement sheet for the big name stars when they appeared. What I have learned in the meantime is that Kreger and Robbins are stars, that their performances of these works may never be bettered. I like to think that's why Koch has decided to bring back the CD. The two Mendelssohn sonatas are mainstays of the cello repertory. There is no better recording of them. The essential sunniness of Mendelssohn's muse is well conveyed in these cheering readings of the two cello sonatas. James Kreger's tone, rich without being overpowering, is well complemented by Gerald Robbins's immaculately turned piano playing. The Variations concertantes and Op. 109 Song without Words provide equally attractive fillers. Kreger and Robbins give every impression of enjoying playing Mendelssohn. Kreger's well-centred tone is ideally suited to the lyrical melodic lines, and Robbins brings a powerful virtuoso style to the piano passages. These players give well-considered performances whose strong expression and lack of affectation take us to the heart of the music. The two magnificent sonatas of Mendelssohn have not tempted the great international violoncellists. It is strange that they constitute in fact the first sonatas for violoncello and piano of the first order, those of Beethoven being, significant inversion, sonatas for piano and violoncello, still marked symbolically by the spirit of the 18th Century. If we except Lynn Harrell, the only violoncellists who have performed Mendelssohn in the last twenty years are the less media-hyped artists like the excellent Maria Kliegel, who has recorded on Naxos a version that until now one could have considered the reference point. Do you know James Kreger? No, neither do I. The notes tell us that this American artist won the Tchaikovsky Competition in 1974, but so many laureates get lost along the way! Moreover, this recording is not a recent one either. Be that as it may, his interpretation is absolutely magnificent, surpassing the quality of Harrell and Kliegel. He has all the qualities for playing these works. The precision, intonation, virtuosity, sound, more indispensable here than elsewhere, because Mendelssohn is also a composer of immediate seduction, of a charm of the first order that must be founded on a beautiful sonority and on beautiful phrasing validating the ineffable cantabile line. But that's not all. There are today those who affirm that Mendelssohn is superficial. The interpretation of Kreger belies that prejudice from the very first second, giving a wild character to the ardent theme of the Allegro assai vivace of Sonata No. 2 (but one could say as much about the attack, in an absolutely mastered low register, of the beginning of Sonata No. 1). It is moreover by this that he distinguishes himself from a Maria Kliegel, in transcending the amiability, the gentleness, the airy lightness of this music. It is not that he lacks elegance. We admire without reservation, for example, the way he starts theme II of the Allegretto scherzando of Sonata No. 2; he goes further in the expression. The variety of his palette allows him to transform the Variations concertantes. There, where many just babble in a slightly worldly manner, he very seriously, deepens the sense, builds and organizes the discourse, plays well the ambiguity of certain climaxes (Andante quasi menuetto of Sonata No. 1). It must be said that he is well seconded by Gerald Robbins. The piano parts of these works are of stunning virtuosity and lightness, but there also, one must go beyond. One passage is significant of the pianist's qualities: the arpeggiated chords at the beginning of the Adagio of Sonata No. 2. Played dull, they sound like finger exercises, but here we sense that the piano creates progressively by successive rebounds, the propitious climax out of which will be born the song of the violoncello. All this is therefore admirable and this version imposes itself as the first choice. 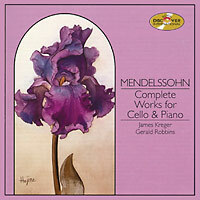 Here we have, in one CD, the complete works for piano and cello by Mendelssohn. Permeated by the passions of Romanticism as his peaceful Leipzig never was, Mendelssohn had the good fortune of becoming the "chosen musician" of Goethe, knowing how to temper his precocious gifts with the proportion and taste of the great classicists. In his instrumental music, therefore, one delights in an equilibrium between the élan, the rhythmic dynamism and the irregular phrasing of Weber and Schumann, on the one hand, and the adherence to the ironbound rules of symmetry and development laid down by Haydn and Mozart. The grand phrases of the opening of Sonata No 2, Op. 58, float freely on the strict triplets of the piano like a rainbow of light, which is then overcome by a number of fragments developed in condensed form by the continuo. Kreger and Robbins already at the beginning ignite the theme with sforzati which prepare the coming articulation. In the same fashion, in the Allegretto scherzando, the gentle breath with which the piano prepares for the entry of the cello, which wraps around one like a climbing plant, allows to emerge in all its magic the juxtaposition of binary and ternary rhythm on which fragment its own airy quality is based. After an Adagio in which Kreger succeeds in articulating the theme with five different shades of piano, the last movement unleashes a moto perpetuo in whose torrents the outlines of all the previous themes re-emerge. In this the two soloists, thanks to an admirable sense of form, do not lose a single one of them. More tormented, less Olympian, the Sonata No 1, Op.45, also receives a definitive reading, from the monumental polyphony of the Allegro vivace, in which Kreger in the chords transforms his instrument into an organ, to the Andante, hypnotic and based on a suspension of tempo which our soloists transform into a study in "cantabile" (The way in which Robbins' right hand rivals the bow of Kreger is admirable.). A final Allegro assai transports us to the childlike playfulness of so much of Mendelssohn: the soloists' rarefaction here gives way to a paler sound which seems like a child's first glimpse of the sea — an ideal interpretation which penetrates into the various expressive shades with an interior intensity which is rare and moving. The other two works which complete the CD are on the same level: the Variations, unleashed in the coda by a cello suspended on a tiny sound particle, which denotes in Kreger absolute control of the bow. Rhythmically free, full of the delights of chamber music, is the transcription of Lied ohne Worte, done by the composer. In the development of 'cello performance, the beginning of the Nineteenth Century saw the sonata as emerging into a totally new, transformed state. The most important 'cello sonatas were those of Beethoven, who raised the 'cello more than ever before to a soloist role, and he gave it much more abundant musical content as well. This further distinguished the art of 'cello playing, which, since the Baroque period, had been relegated to an accompanist role. Ever since then the 'cello has become one of the public's most beloved classical instruments. Mendelssohn's 'cello sonatas have become the most recognized solo pieces in the Romantic school after Beethoven. Mendelssohn is also a famous child prodigy in musical history. When he was young he usually performed the piano part in his own chamber works. In 1838 Mendelssohn wrote a letter to his friend and said that although piano compositions can best show his talent, he personally felt that chamber music involving stringed instruments would satisfy and fulfill him the most. Therefore, he started to compose his 'cello sonatas. The same year (1838) , on the 13th of October, the first 'cello sonata was completed. At that time Mendelssohn had just recovered from the pain of illness, so in this music he made a point of portraying the message of joy. This beautiful sonata can aptly describe Mendelssohn's own feeling about his music: "This is the artist always with a smile on his face. He shows he derives happiness from his art, and he feels satisfied in his own world. The Cello Sonata No.1, Op.45 is composed of three movements. it is a typical fast-slow-fast structure. Five years later, in 1843, Mendelssohn completed his second 'cello sonata, Op. 58. On November 18th of the same year he also played with the 'cellist Carl Wittmann. The difference of the second sonata from the first sonata reflects the pressures of Mendelssohn's life at that time: In order to maintain his career, he was constantly commuting between Berlin and Leipzig. This caused a stress to his psychological and physical condition which was reflected in his second sonata. This work is composed of four movements. Of course, the character of this piece is quite different from that of the first sonata. Variations concertantes, Op. 17 was the first piece Mendelssohn wrote for 'cello. It was completed on January 30, 1829, and he wrote it for his brother Paul. This work is composed of six variations. Gradually as the variations progress, one especially can sense the accumulated power of this music. The Song without Words, Op. 109 was completed about 1845. It is famous for being one of the most beautiful short pieces for 'cello. The pianist on this CD, Gerald Robbins, was a prize winner at the Van Cliburn Competition in 1969. He has been a guest soloist as well as having played numerous chamber music performances. He has accompanied Milstein, Zukerman, Kyung Wha Chung, and others. Therefore, he has rich experience as a collaborator with string instrumentalists. Although these two musicians are not tremendously well-known superstars, the music they present on this CD casts a genuine spell on the listener. As there are not many versions of this repertoire on the market, I would like to boldly recommend that the performances on this CD be considered as the standard of reference for the 'cello music of Mendelssohn. As I said before, these four pieces basically have different styles, necessitating that the soloist use different techniques and interpretive approaches in order to elucidate this variety of expression; otherwise, this music would be devoid of life. Kreger's approach to the technique of vibrato and colors creates an elegant and balanced, noble tone. Even when he plays such romantic music as the Song without Words, Kreger always is in complete control of his bow and vibrato. He never is excessive or exaggerated in his approach, which would destroy the beauty of the calm and the atmosphere of the piece. Indeed, he presents a highly successful performance. In the two sonatas Kreger and Robbins achieve a wonderful collaboration and communication. This can be classified as the model of chamber music: two instruments continuously communicating with each other, merging their differences into an implicit agreement, creating in the music an ever-increasing attraction. Especially because the 'cellist and pianist have created such an intricate design, a wholly different character is brought to each piece of music. These performers loyally bring the message of the composer to the listener — from heart to heart. Whether a CD is successful or not often depends upon the devotion of the performers. Obviously, we can imagine these two artists have spent a great deal of time in order to communicate with each other, and the achievement is the creation of this excellent CD, superbly fulfilling the message of Mendelssohn's music and spirit. During the last two years of Mendelssohn's life he was deeply touched by the performances of the young cellist Alfredo Piatti. He also wrote a concerto for him, which unfortunately has been lost. Even if only just a part of this concerto still exists, its beauty and romance would make it one of the strongest candidates in what has been a traditionally sparse list of great cello concerti. However, at least Mendelssohn left us four marvelous cello pieces. In my collection I have only two CD's of the complete cello works. Besides this Koch Discover CD (Kreger/Robbins), I have the BMG CD (S. Isserlis/M. Tan). Before anyone would listen to these two CD's, of course they would choose the Isserlis CD first, because it is from a large company (BMG), and the cellist Isserlis is someone who has been expected to be one of the stars of tomorrow. And the pianist Tan has achieved recognition from his recordings of the 5 Beethoven Piano Concerti with Norrington. If one uses this kind of comparison, then James Kreger is not as known or famous in the music world. If the Taiwan distributor had not imported the Koch Discover catalog, then music lovers would never have had the opportunity to recognize this super marvelous artist cellist. The American Kreger participated in the Tchaikovsky Competition in 1974. Although he did not receive the first prize, he was the top American prizewinner. On this CD, not only is his music full of richness, abandon, and elegant beauty from the lowest to the highest registers of the cello, but it always maintains the true and inevitable sense of the sound. Something exceedingly rare to find, especially in our present day, is Kreger's rich musical persona and his sense of reverent dedication to the message of the music in addition to his portrayal of the changes between emotional light and shade. Van Cliburn competition winner, pianist Gerald Robbins, proves himself to be an excellent collaborator. This performance deeply catches the heart and spirit of the listener. All these points which have been mentioned are something which Isserlis can never hope to achieve! I am hereby seriously recommending this CD as the best cello recording of the year. The American Cellist James Kreger created a furor when he placed near the top in the 1974 Tchaikovsky Competition in Moscow, in a time when it was still possible for participants from the West to place in the higher ranks. In the German-speaking world Kreger, who also won the Piatigorsky Prize, is much less well-known than in America. Now he appears with an interpretation of the complete cello works of Felix Mendelssohn, repertory pieces which challenge not only the cellist, who has many wonderful passages to play, but also the pianist. The pianist, in difficult music which reflects Mendelssohn's own excellent pianistic talent, must go far beyond mere accompaniment. Gerald Robbins, who has also collaborated with many renowned violinists, leaves no doubt as to the importance of his part. His presence is felt in the sound and shaping of the music. In the Variations concertantes his attack is almost too strong. Here Mendelssohn's piano sound begins to remind us of the thundering piano keys of Liszt. It is a genuine pleasure to hear the wonderful cello works of Felix Mendelssohn. James Kreger proves himself a formidable musician, whose polished technique is allied with great musical passion. He makes his cello sing in the most eloquent way, shaped with intelligence and a delightful sense of the musically obvious. Mendelssohn's complete cello works are often played — indeed they form part of the core of the cello repertoire. But one must search far and wide to find such a fresh, convincing and tasteful interpretation. Pianist Robbins plays with a lyrical, legato phrasing and a carefree lightness which one hears so seldom in present day pianists. A few intonation problems, not uncommon in these works, do not diminish the overall recording in any way. Much more important is that Kreger and Robbins impart a unique character to each of the four works. Highly recommended. Although the cellist Boccherini had tried to promote the cello as a more important character in his chamber music, by the end of the 18th Century the cello gradually started to get rid of its stereotyped role as a bass line accompanying instrument. Mozart never wrote a solo cello piece. Beethoven wrote five cello sonatas; however, he too had some doubt about using the cello as a principal voice, which is why in his compositions he limited the scope of the cello line. It was Mendelssohn whom the music historians recognize as the first composer who took the cello as a proper solo instrument. In 1843 Mendelssohn completed the Sonata No. 2, Op. 58, which he wrote for Count Wielhorski, who studied with the famous teacher Romberg and owned his own Stradivarius instrument. This piece is full of the fragrance of the great Mendelssohn compositions. The Song without Words, Op. 109 was completed about 1845. Mendelssohn structured it in three parts, the first and third part being of a most tranquil nature, while the middle part is more emotionally intense. American cellist Kreger won the Piatigorsky prize when he was 18 years old. In 1974 he was a winner at the International Tchaikovsky Competition, Moscow. He has also played with the famous pianists Ohlsson, Goode, and Schiff. He is currently a faculty member at the Juilliard School in New York City. The pianist on this CD, Robbins, was a winner at the Van Cliburn Competition in 1969, and he has been accompanist for Milstein. He is also known for having recorded the music of Litolff and Reinecke. These two masterful musicians, Kreger and Robbins, have created this CD, which wonderfully shows the marvel of Mendelssohn's melodies. The beauty of each singing line is achieved with noble elegance. They also show a spiritual interaction which projects the immediacy and power of life. This Koch CD unexpectedly shows a quality of purity and fragrance. For those who love beautiful melodies, they should be able to derive from it a surprising happiness. James Kreger's wonderful performance shows a very deep tone and strong bow arm under complete control. He sings the melodies of Mendelssohn with a beautiful voice. Especially in the third movement of Sonata No. 2, his sound is so deeply expressive that it touches your soul. Indeed he plays the theme of this movement absolutely beautifully. Mr. Robbins' piano playing is also melodic and expressive and shows complete compatibility and communication with Mr. Kreger. In the Song without Words, their performance is persuasive enough for us to understand the true meaning and importance of the "song" to Mendelssohn.